- Sony Ultra-wide Angle 26.3mm G lens captures brilliant, accurate color reproduction and sharp, detailed images out to the corners of the frame. In addition, the 26.3mm focal length offers a broader perspective for capturing a wider perspective. - Assignable Lens Ring (Focus/Zoom/Iris) The HXR-NX70U lens has an assignable lens ring -via a rotary switch- that allows manual adjustment of focus, iris, and zoom settings. The camera also has a professional style (front to back) zoom rocker, similar to the HXR-NX5 for variable, servo zoom control. - Optical SteadyShot image stabilization with Active Mode compensates for greater degrees of camera shake to deliver stunningly smooth video from wide angle to full telephoto shooting. In addition, the innovative 3-Way Shake-Canceling feature adds electronic roll stability for even smoother video capture. - Native 16:9, Back-illuminated Exmor R CMOS sensor. Sonys back-illuminated Exmor R CMOS sensors are well known now for low-light sensitivity, image clarity and drastically reduced noise. - Infrared NightShot (night vision) filming and photography. The HXR-NX70U incorporates an IR illuminator that produces moderate levels of infrared light, enabling effective night time imaging under low light conditions. The resulting images are typically higher resolution than other night vision technologies. - AVCHD Recording + 96GB*5 embedded Flash Memory. As in other NXCAM camcorder, the recording format is AVCHD. One Memory card slot accepts either Memory Stick or SD Cards. Its built-in 96GB flash memory permits long recording times exceeding 10hrs at 24Mbps and 8hrs at 28Mbps. Simultaneous recording to the Memory card and built-in flash is possible in some modes. - 1920x1080 60P full HD recording at 28Mbps. The new PS mode with a 28Mbps recording bit-rate enables the HXR-NX70U to capture full HD at 60P. Its full HD 1920x1080 recordings can be slowed down too 24P during post production for beautiful 2.5 slow motion. - GPS Geo Tagging A built-in GPS receiver allows viewing the HXR-NX70Us current location coordinates on the LCD display, as well as "tagging" the clips with shooting locations. The receiver gives the ability to tag shooting locations as a future reference if it is necessary to return to the same location or to create a log of areas covered when surveying remote locations. Additionally, the receiver automatically adjusts the camcorders clock to the proper time zone when international travel is part of your assignment. Locations can be tracked on Google maps and all GPS data can be extracted with a PC. - 3.5" touch-screen XtraFine LCD display (921K). A large 3.5" (16:9) XtraFine LCD screen (921K) displays sharp, bright, vivid images, for composing more easily; even outdoors. By reducing glare, remarkably higher contrast is achieved, delivering more natural, realistic colors and allowing easier viewing in bright lighting conditions. - Direct Copy to external HDD without PC. As other Sony NXCAM camcorders, it is possible to field backup entire cards or important shots by copying footage directly from your camcorder to an external USB hard disk drive; all without the need for a computer. 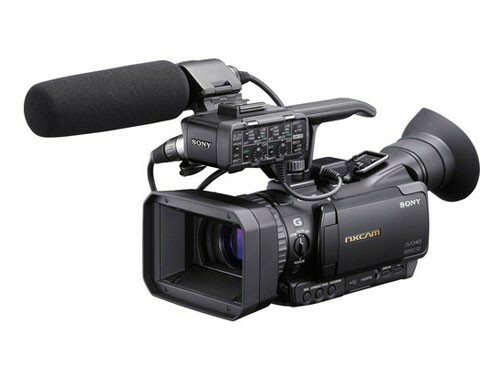 The HXR-NX70U can also access clips stored on the external hard drive for playback on a monitor, allowing utilizing the camcorder's powerful playback indexing features. - Detachable handle/ professional audio control unit. A detachable audio pod includes two balanced XLR audio inputs with phantom power and attenuation options required by professionals. Default audio settings for XLR recording are highlighted in green for easy reference in the field under difficult lighting conditions. The included ECM-XM1 shotgun microphone provides audio recording performance similar to larger shoulder-mounted ENG style cameras. Note: The XLR adaptor and ECM-XM1 microphone are not rainproof or dustproof. - The HXR-NX70 is the first camroder with IPX54 certification. IPX54 enables shooting in rainy and dusty conditions.